Joe: Hey, Santa. How’s it going, big guy? Santa: How did you get my phone number? You want to get on my naughty list? Joe: Talk to the Easter Bunny. He said I could txt you any time. Santa: Damn autocorrect. Nevermind. You’re not going to ask me to make you look like one of the Magic Mike guys again, are you? I can only do so much. Joe: Nah, don’t worry, that kinda backfired. All that exercise equipment you sent remains unused. But thanks for the thought. Santa: So what do you want this year? Joe: I want to thank you for all that you did bring me. You brought me a girlfriend, which was awesome nice of you and even though she didn’t arrive until Feb, she’s the most amazing present ever. Santa: Well, actually that wasn’t me. Joe: And I want to thank you for giving me the courage to do a whole bunch of things this year that I’d never thought I’d do. Santa: Listen, Joe, I think you’re mixing me up with God or fate or whatever you writers believe in these days. Joe: And I’d like to thank you for all the great friends in my life who support and believe in me. Santa: OMG. Stop it. It wasn’t me. Joe: Anyway, for this year, I’d like only one thing. Santa: Here it comes. I’m going to ducking kill that bunny. Joe: So here’s the thing. I want no more rejection letters. I want an agent who believes in me as much as my friends do, as much as my writing group does, as much as my dog does. Santa: Are you kidding me? Santa: OMFG! Will you nut up already? Joe: Santa! You sound kinda angry. Santa: I am. You think you’re the only one who has to deal with rejection? Try being me. As soon as kids reach a certain age, whammo, they don’t believe in me anymore. Talk about in-your-face rejection. Like I suddenly cease to exist. They stop sending me letters and singing songs about me, and leaving cookies and milk for me, but do I get all mopey and whiny? No. No I don’t. Cuz I’m ducking Santa. I keep on doing what I love to do. Santa: Just don’t give up. Keep on trying. I mean, hellsbells, man, you managed to get an amazing, beautiful women. The raindeer had a pool that listed the odds agianst that happening at 200-1. So believe me, if you can do that, you can do anything. Santa: I know so. Listen, trust in the process. Write. Send. Repeat. The rest will follow. I told King that and look what happened, but holy hell, the things that kid wanted for Christmas, I still have nightmares. Joe: I hear what you’re saying fat man. But now I want something else. Joe: I want this to be the best Christmas for everyone, especially for my girl and her two boys. Santa: Well, I guess that’s something I can try and do. 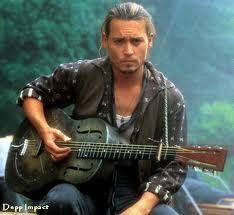 Now duck off, I have Johnny Depp texting me that he wants to find someone named Corinne. Apparently he’s in love. Ich. This entry was posted in Writing and tagged christmas lists, Dear Santa, easter bunny, inspiration, Santa, Stephen King, writer's journey by Joe Cummings. Bookmark the permalink. Haha. Too funny Joe! Wishing the most awesome Christmas ever! You too, Karalee. Have a great Christmas and happy new year. Nice. So happy you & Corrine found each other. Marry Christmas! That was epic. Thank you! Almost finished your book, Bev. Good, strong writing, great voice, lovable characters. I always suspected, no knew it: you are a closet romance writer trying to come out. Humour and happiness … What’s not to love? This post just made me feel good. It’s really true – everybody loves a lover (I can just hear Doris Day – was it Doris or one of her clones who made that a huge hit? – singing in the background of your personal soundtrack). Hope you and Corinne and the boys have the most amazing Christmas ever! Have the bestest Christmas, Silk! Thanks for your kind comments. 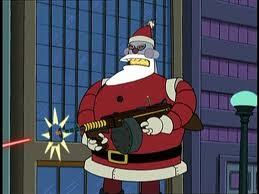 Oh yeah … Where in the name of all that’s holy did you find the evil little pic of Santa with an automatic weapon? You two break me up. I was thinking as I read Joe’s long excited explanation that could have answered Silk”s question after one word ‘Futurama’, what is Silk feeling about this mass murdering non-Santa going on a rampage? I laughed out loud at your response Silk!! Love this group.